"The nurses and the doctors there would bring a teen back for her prenatal visit and they would say, 'Hey! Aren't you Maria's younger sister?' And the young woman would say, 'Yeah, I am!' And they would say to another patient, 'You know, haven't I seen you before?' And she would say, 'Yes, I was here for my older sister when she was pregnant.' "
Over and over East heard variations of this conversation, until it came to the point that when she saw a younger sibling sitting next to her sister in the waiting room an involuntary thought flashed across her mind. "It's almost as if you're watching the younger sister get pregnant," she says. And so East decided to do a study. She wanted to figure out if having an older sister who got pregnant as a teen really did affect the likelihood that the younger sibling would find herself in the same position. She identified a large number of sister pairs — all pairs came from roughly the same socioeconomic and life circumstances. And by comparing them, she found that a pregnancy in an older sister did often seem to change the trajectory of the younger sibling. "The younger sisters are five times more likely to get pregnant as other young women who have an older sister who hasn't been pregnant." In the aftermath of the bombings in Boston many of us have been thinking a lot about siblings — particularly how older siblings can shape the lives of younger siblings. But until pretty recently, the role siblings play in determining the trajectory of each other's lives hasn't been a particularly hot topic in psychological research. Psychologists, very understandably, have focused on the influences they see as more important — such as parents and peers and genetics. But in the past decade that's been changing a bit. Psychologists interested in how siblings affect one another are taking a new look at all kinds of behavior, particularly anti-social behavior. Richard Rende, a professor of psychiatry at Brown University, is one of the people doing this work, and he says that some of the new findings really challenge the idea that parents are the most important influence on children. Consider, for example, the research that looks at how much a parent who smokes influences his child to smoke, versus the degree to which an older sibling who smokes influences a younger sibling. "Both can have an effect, but in a lot of studies they've found that the effect 'older sibling smoking' has is greater than the effect that 'parental smoking' has," Rende says. It's the opposite of what many people assumed, he says. Older siblings are more influential. Rende says you can see this influence of big brothers and sisters in all kinds of families — rich, middle class and poor. But their power is really magnified in the particular subset of families he studies: families that are psychologically and economically unstable. In those families the power of the older sibling is much greater because parents aren't around as much, and the siblings tend to spend a lot of time together. As part of his research, Rende gives sibling pairs electronic devices like cellphones that, every half hour, prompt both siblings to report what they're doing. Through such reports you can actually see each one ghosting the other's behavior, he says. "When one sibling is smoking — in real time [we see] they're having a cigarette, and the other sibling is very likely to report smoking at the same time." In fact, when one sibling is a smoker, the other is 25 percent more likely to smoke. With drinking the risk is even higher; a person is 36 percent more likely to drink if a sibling does. Rende, by the way, believes that the reverse is also true. Good behavior in older siblings can be as contagious as bad. It just seems that — particularly when families are struggling — the fate of the kids is more tethered to their siblings than we originally thought. For good and, apparently, for bad. 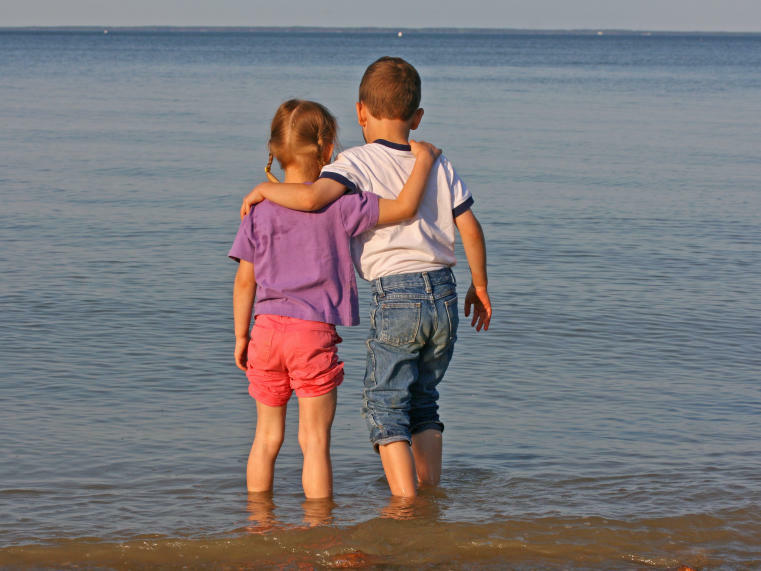 In the wake of the Boston bombings, many of us have been thinking a lot about siblings, particularly how older siblings can shape the lives of younger ones. NPR's Alix Spiegel decided to take a look at some of the research and filed this report. ALIX SPIEGEL, BYLINE: Patricia East is a developmental psychologist who began her career working at an OB/GYN clinic in California. Thursday mornings at the clinic were reserved for pregnant teens. When East arrived, the waiting room was packed with them. And it was in this space, she says, that she discovered her life's work: an accidental discovery that came from the casual conversations staff had with their younger patients. PATRICIA EAST: The nurses and the doctors there, you know, would bring a teen back for her prenatal visit and they would say, hey, aren't you Maria's younger sister? And the young woman would say, yeah, I am. And they would say to another patient, you know, haven't I seen you before? And she would say, yes, I was here for my older sister when she was pregnant. SPIEGEL: Over and over, East heard variations of this conversation. EAST: Aren't you Rebecca's sister? Aren't you Anna's younger sister? SPIEGEL: Until it came to the point that when she saw a younger sibling sitting next to her sister in the waiting room, an involuntary thought would flash across her mind. EAST: It's almost like you're watching the younger sister just get pregnant. SPIEGEL: When her older sister gets pregnant? SPIEGEL: And so, East decided to do a study to figure out if having an older sister who got pregnant really did affect the likelihood that the younger sister would find herself in the same position. She compared a large number of sister pairs, all with the same socioeconomic and life circumstances, and found that the behavior of the older sibling did often change the trajectory of the younger. EAST: The younger sisters are five times more likely to get pregnant, as other young women who have an older sister who hasn't been pregnant. SPIEGEL: Five times. Now, until pretty recently, the role that siblings play in determining the trajectory of each others lives hasn't been a particularly hot topic in psychological research. Psychologists, very, very understandably, have focused on the influences that they see as more important - parents and peers and genetics. But in the last decade or so, that's been changing. Psychologists interested in how siblings affect one another are taking a new look at all kinds of behavior, including really troubling anti-social behaviors. RICHARD RENDE: Damaging property, breaking and entering, stealing, getting into physical fights that are serious. SPIEGEL: This is Brown University professor Richard Rende listing off some of the anti-social behaviors this research has covered, some of which really challenges the idea that parents are the most important thing. Consider the research which compares how much a parent who smokes influences the younger sibling, to how much an older sibling who smokes influences a younger sibling. RENDE: Both can have an effect. But in a lot of studies, they found that the effect older sibling smoking has is greater than the effect parental smoking has. SPIEGEL: Older siblings seem more influential. Now, Rende says you can see older siblings' influence in all kinds of families, whether they're rich or they're poor. But their power is especially magnified in the subset of families he studies: families that are psychologically unstable. There, the power of an older sibling is much greater because parents are often not around, and so siblings are spending a lot of time together. As part of his research, Rende gives sibling pairs electronic devices, like cell phones, that every half-hour prompts them to say what they're doing. And he says you can literally see their behaviors ghosting each other. RENDE: When one sibling is smoking in real time, they're reporting that they're having a cigarette, the other sibling is very likely to also report smoking at the same time. SPIEGEL: In fact, when one smokes, the other is 25 percent more likely to smoke at that moment. With drinking, they're 36 percent more likely to drink. And Rende believes that the reverse of this is also true. Good behaviors in older siblings can be as contagious as bad. It just seems that particularly when families are struggling, the fate of the kids can be more tethered to each other than we originally thought. For good, Rende says, and also unfortunately for bad. This is NPR. Transcript provided by NPR, Copyright NPR.